Looking for an easy way to create student ID Cards for Schools, University, Colleges? 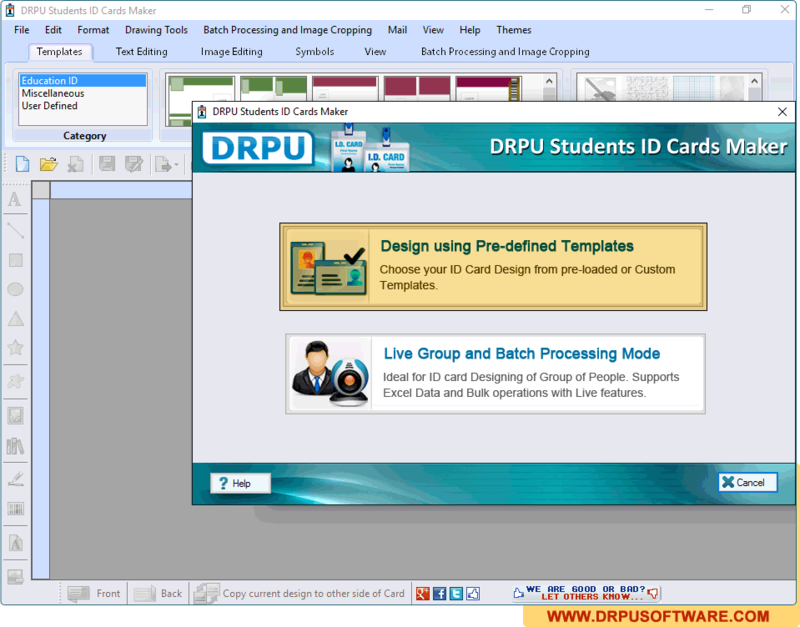 DRPU Software presents 'Student ID Cards Maker Software' to design and print multiple students ID cards at the same time with different barcode value and text. If you want to design ID cards for group of students at the same time, Software provides 'Live Group and Batch Processing Mode" that designs ID cards of multiple students using Excel data file. You can also browse all the details from Excel file while designing student ID Cards. You can start designing student ID card by choosing Pre-defined template available in our software and email that designed ID card to the specified email id whenever required. You can choose any mode either "Design Card using Pre-defined Templates" or "Live Group and Batch Processing Mode" for designing ID Card. Here, we have choosen "Design Card using Pre-defined Templates" mode for demonstration purpose. Software is having various tools including Text, Rectangle, Ellipse, Triangle, Signature, Barcode, Watermark etc. to design ID cards. Software facilitates to print your designed Student ID Cards using Print Setting Option. You can also Email your designed ID cards at specific email address using DRPU Student ID Cards Maker Software. To crop a single image or multiple images for ID card. You can save cropped images in different file formats as JPEG, PNG etc. Software is having Camera Setting option to take the picture using Camera while designing ID card. To generate multiple Student ID Cards at a time with different barcode value and text. You can also design Student ID Cards using Excel data file.